It’s another weekend to get busy and try something new in the kitchen. I’ve started out on mine and you should too. 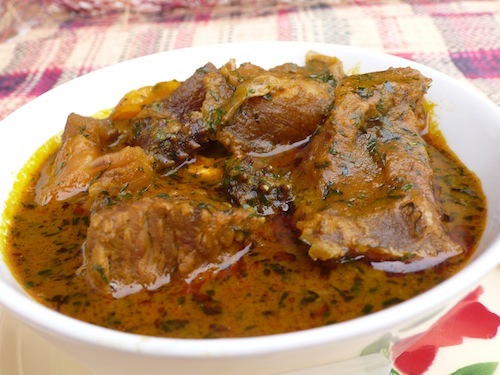 Try your hands on Abak Atama soup from Akwa Ibom and Cross River states. It’s tasty and nutritious; similar to Banga soup from the Delta/Edo region. 2. Pound till the flesh is separated from the nut. 3. Boil some clean water and add to the pounded palm fruit and mix thoroughly to separate the oily extract from the rest of the pulp, then using your hand squeeze out the juice from the pulp. 5. Wash, cut up and season your meat with salt, seasoning cubes, pepper, then steam for about 5 minutes on low heat. Then add about 1½ cups of water and the stockfish head and continue boiling for about 20 minutes till the meat is almost cooked, and remove from heat. 6. Cut the Atama leaves into very fine pieces. Pound them for about 10 minutes till the leaves are finely pounded. Then place the oily extract on the burner and allow to boil for about 5 minutes to remove all moisture. 7. Add cooked meat and washed smoked fish, meat stock, periwinkle, crayfish, pepper, seasoning cube and Uyayak. 8. Cook until it starts to thicken and add your Atama. 9. Add salt to taste and cook for a few minutes. 10. Serve with pounded yam ,rice, yam, semi or eba. Let’s know how it turns out.